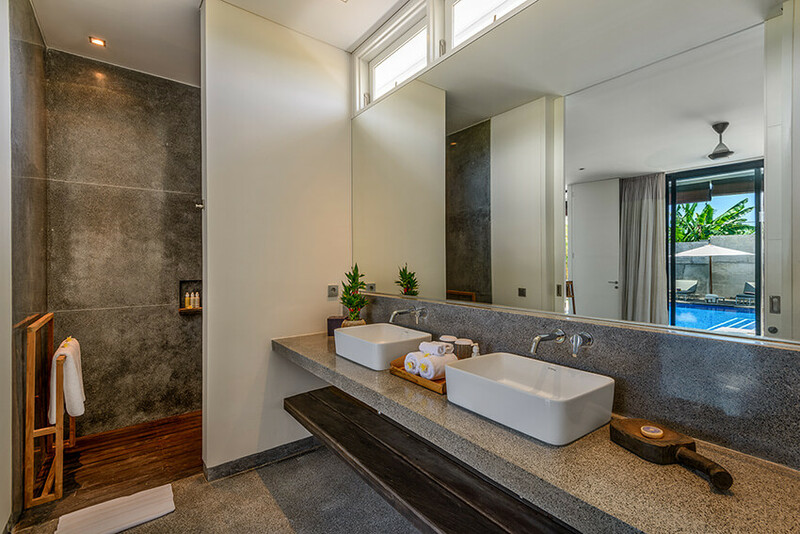 Four-bedroomed Villa Waha is a dream come true for lovers of a modern, minimalist aesthetic. 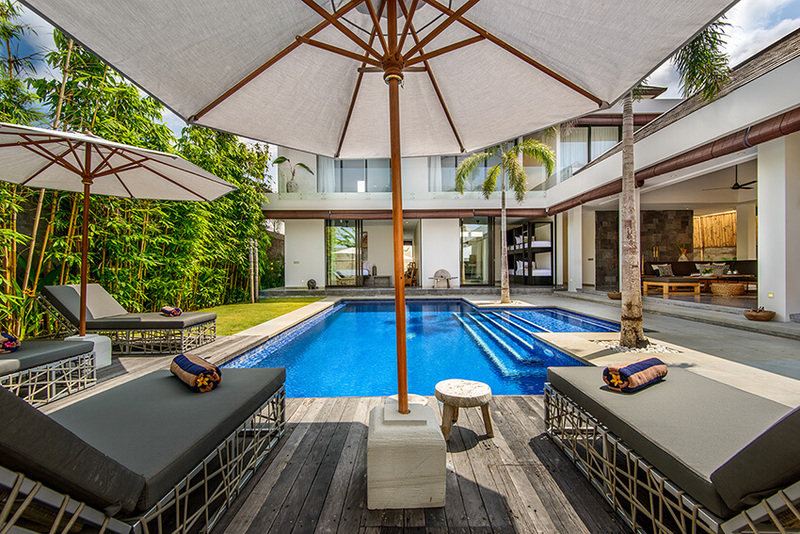 Located close to Berawa Beach and Canggu Club, on Bali’s south-west coast, this architectural masterpiece is a stunning example of east-meets-west, where contemporary design sits flawlessly in an idyllic Balinese setting. 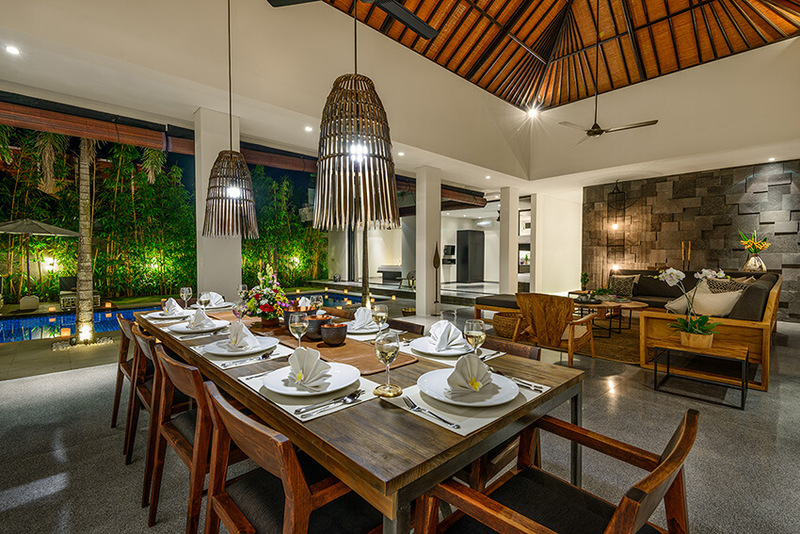 Fully staffed including personal chef, Villa Waha is the perfect family villa, or for groups of friends wanting a spacious comfortable villa close to beaches, Canggu’s famous surf spots and restaurants / cafes and still within easy reach of bustling Seminyak. 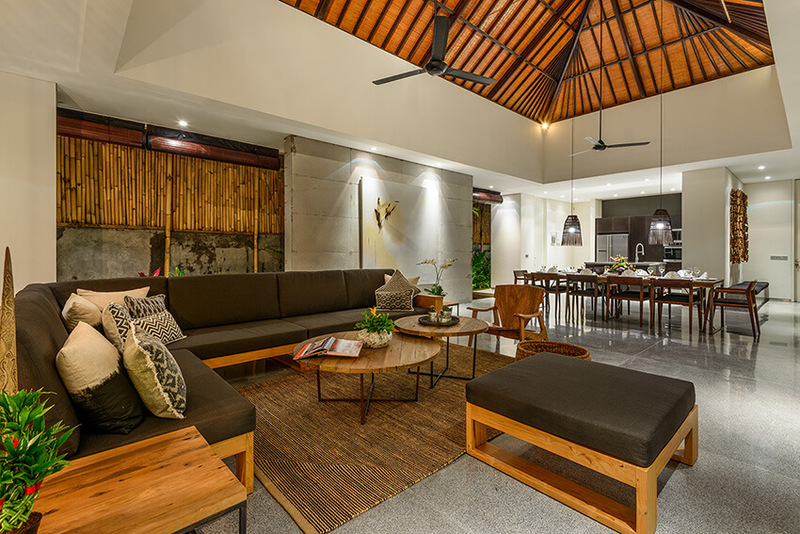 The villa’s chic lounge, dining and kitchen spaces are open aired with superb timber minimalist sofa and ten seater dining table. 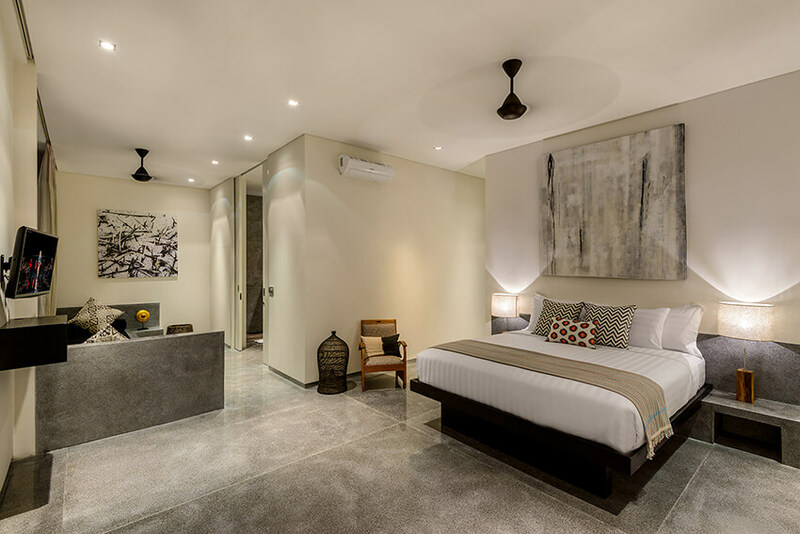 Polished cement flooring is a stand out feature throughout the villa bringing a welcomed coolness amid the tropical climate. The living space opens onto the 12-metre pool with timber-deck surround and immaculate garden, which bursts with a palette of green and yellow. 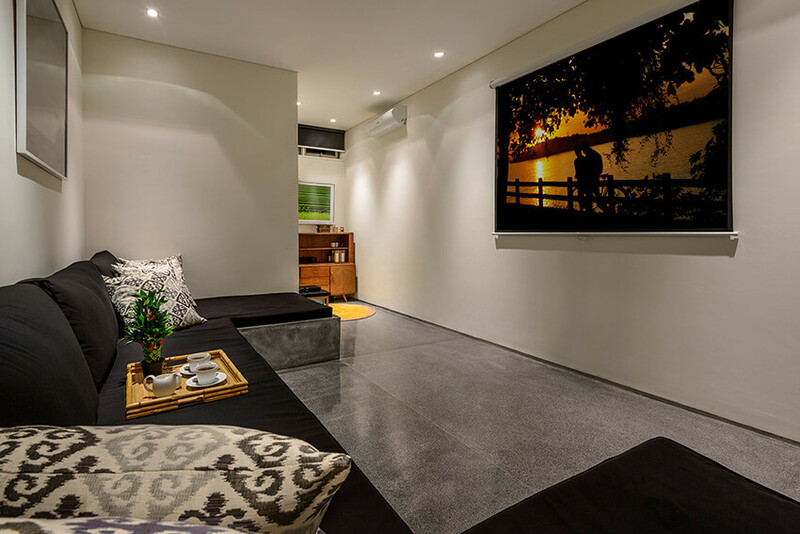 When the kids get tired of swimming, then parents will be happy to know that adjacent to the living area is a fully air-conditioned cinema room equipped with Sony movie projector and ample seating for all the family. 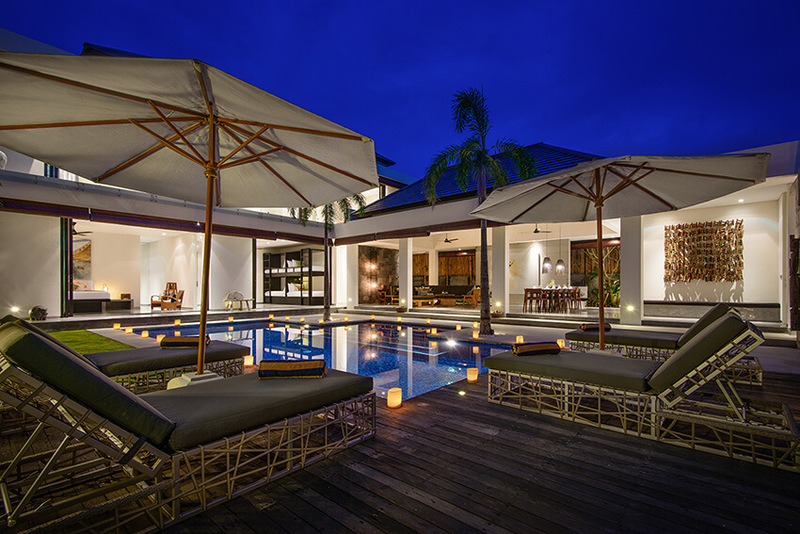 Wi-Fi is also freely available throughout the villa. 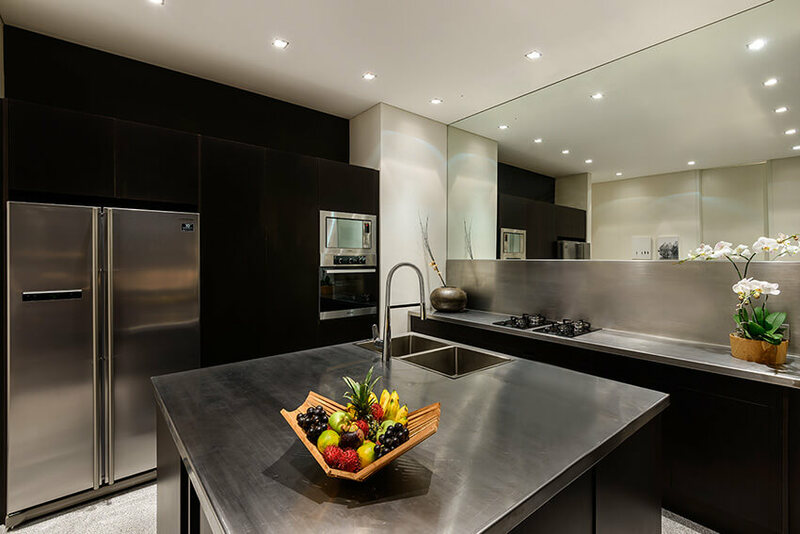 The minimalist and chic vibe carries through into the four bedrooms along with the cooling polished cement surfaces. 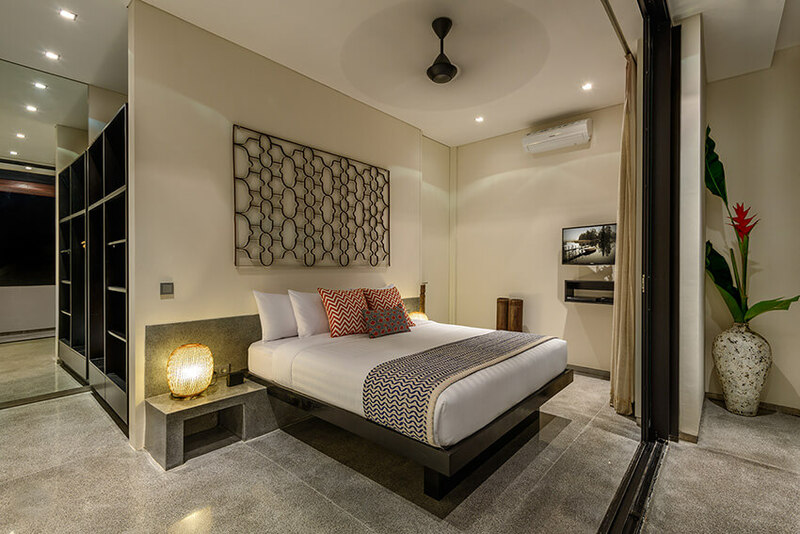 Villa Waha has certainly been designed by the owners with families in mind, with the two ground floor ensuite bedrooms overlooking the pool having an interconnecting door, one with a king size bed and the other bedroom perfect for kids of all ages equipped with four cabin-style bunk beds. 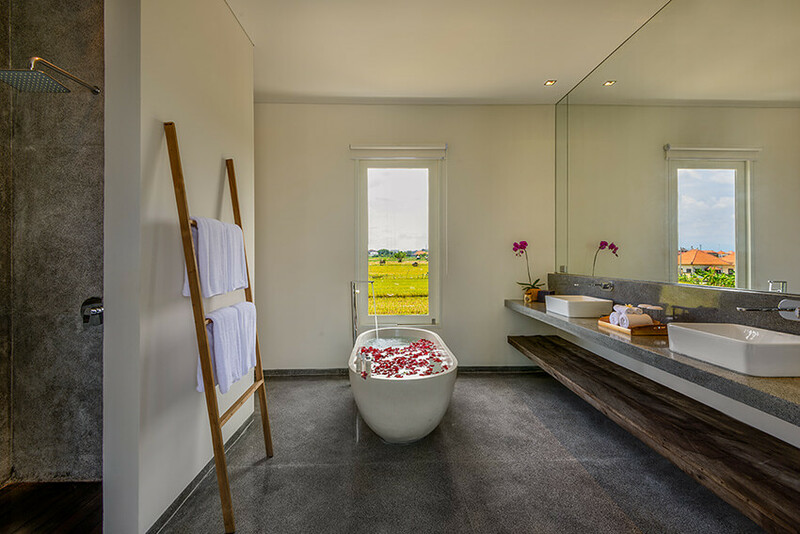 Upon ascending the staircase to the second floor bedrooms, one cannot help but be mesmerized by the amazing views across the bordering rice fields. 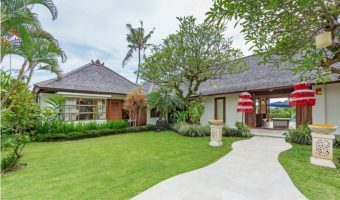 Both bedrooms comprise king size beds, with the upstairs master bedroom offering larger floor space, built-in day bed style sofa area, and views across the treetops towards Berawa Beach and the Equestrian Centre. 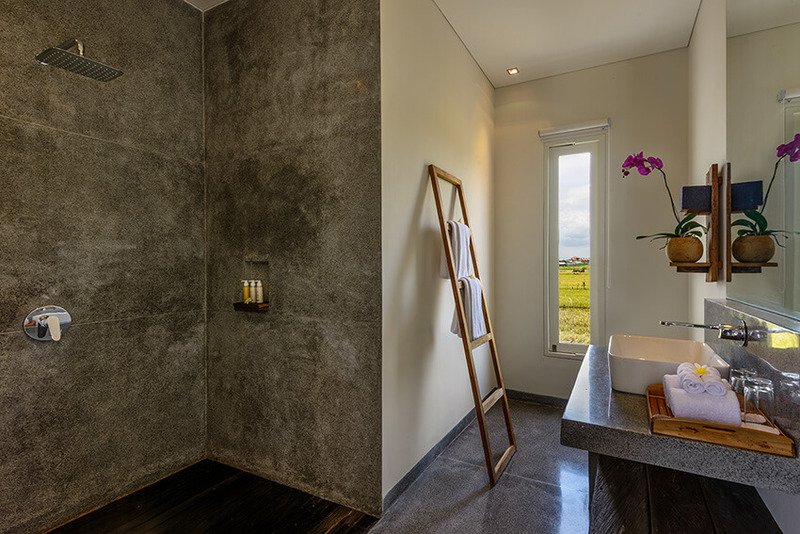 A terrazzo bathtub is the highlight of the master bathroom, strategically placed so you can lie back and take in the views from the lush rice fields and slip into a dream state. 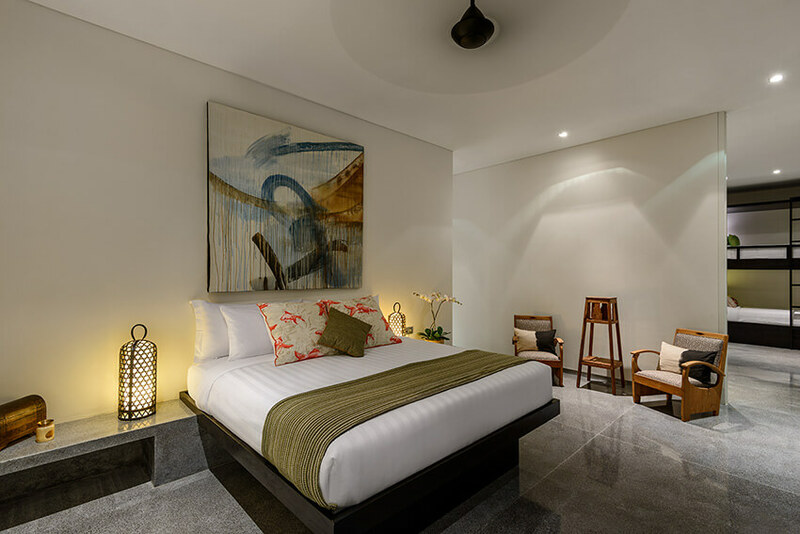 Each of the four bedrooms feature 32” flat screen TV’s with DVD player, air-conditioning, ceiling fans, spacious wardrobe areas, safety deposit boxes and full bathroom amenities. 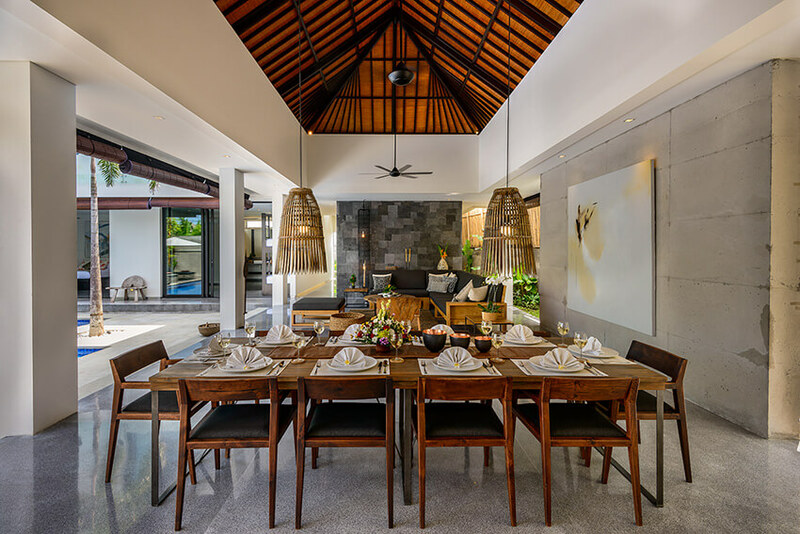 A team of friendly and efficient Balinese staff, including villa manager, housekeepers and butlers, look after guests’ every need while the private chef dazzles with his culinary creations in the villa’s sleek stainless steel kitchen. 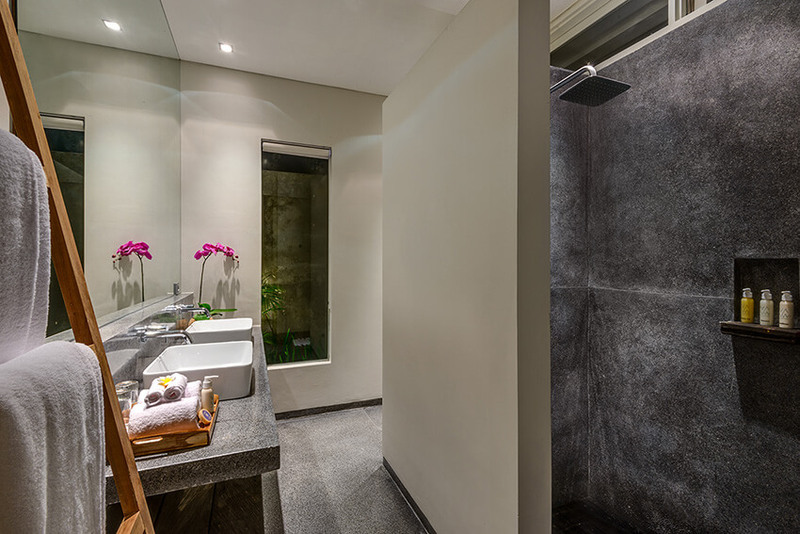 Discreet housekeeping staff will ensure the villa is kept impeccable throughout your stay and help to deliver an unforgettable Bali holiday experience. 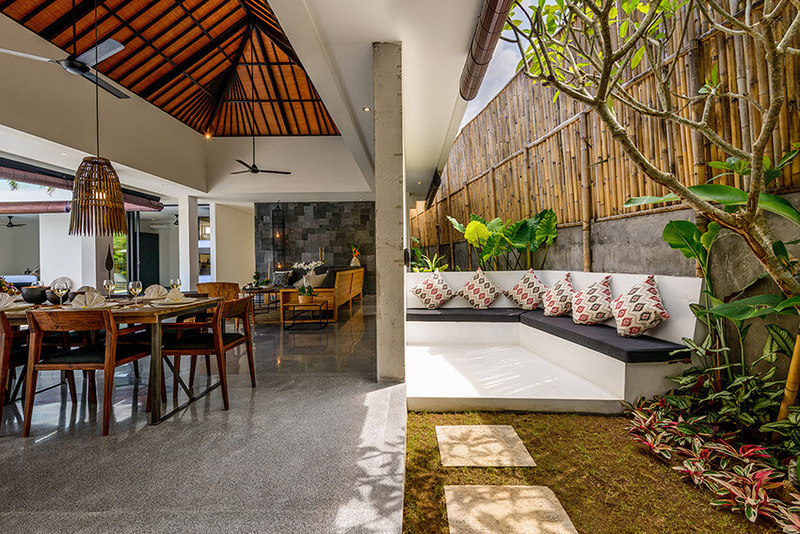 Located on the doorstep of beautiful Berawa Beach, Villa Waha is also a short stroll from the Bali Equestrian Centre where sunset beach rides can be arranged for the whole family. 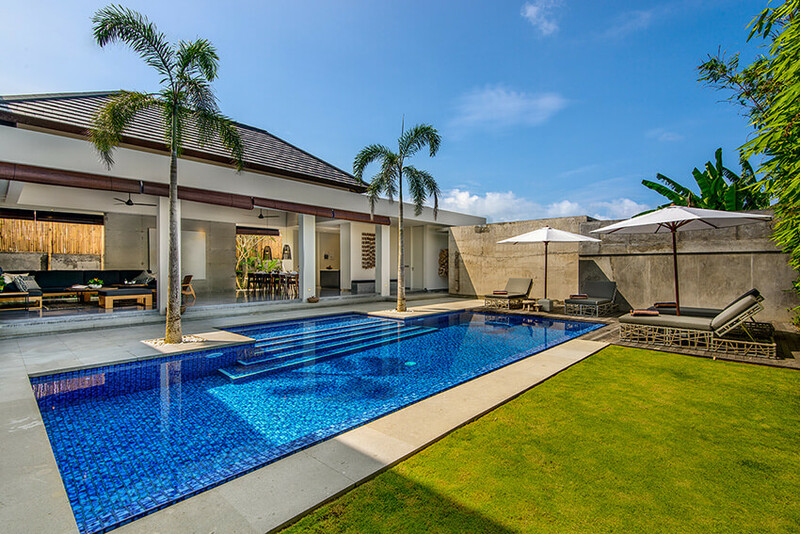 Strategically located a few minutes from Canggu Club and its entertainment/sports/leisure facilities including, waterpark, tennis, bounce kidscenter, ten pin bowling and a world class gymnasium. Head to Echo Beach, just 5 minutes away and enjoy a sunset barbecue seafood feast.